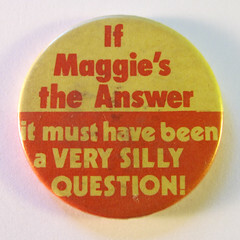 Anti-Margaret Thatcher badge, a photo by dannybirchall on Flickr. Labour’s current desire to abstain on most of the Tories’ welfare cuts is just one example of how true Thatcher’s words were. Margaret Thatcher’s success (and the fall of Communism, to be fair) made Tony Blair and most other Labour politicians believe that the only way forward was to change Labour into a carbon copy of the Tories. The result of this was that there was hardly any debate on a UK level on the alternatives to Conservative ideas until the SNP tsunami in May. The party’s Westminster leader Angus Robertson now has two goes each week at Prime Minister’s Questions. This might seem like a trivial detail but it is worth remembering how much of the No. 10 machine is geared towards readying the Prime Minister for his most important half hour in the Commons. George Osborne, Michael Gove and several of Cameron’s senior aides devote Wednesday mornings to helping him prepare for this appearance. ‘We’re having to take a lot more interest in the minutiae of Scottish politics than before,’ one of those involved in these prep sessions tells me. There are also many signs that Jeremy Corbyn is rapidly changing the debate within Labour. If he wins, there’s a possibility that Thatcher’s greatest achievement will be undone (unless, of course, the Blairites decide to split the party or commit some other form of collective harakiri). No matter how incredible or ludicrous, Corbyn would still have six questions at PMQs. His frontbench would still have a representative on Question Time and Newsnight. His party’s policy announcements and press releases would get just as much news coverage as a credible opposition. I don’t agree with his characterisation of Corbyn’s policies as a rejection of reality (I’d argue most Tories are much further removed from it in fact), but I think he makes a very good point about how it would undermine Conservative ideas (which would be great in my opinion). Just as the rise of UKIP has had an enormous impact on the British debate on Europe, forcing Cameron into a referendum he did not want as his party felt it needed to counter Farage, a distinct new Left movement would exert a gravitational pull on the centre-left more broadly and on the national conversation about taxation, ownership, profit and constitutional reform of the voting system and the House of Lords. The rise of Corbyn is already forcing terrified Labour moderates such as Andy Burnham to say all sorts of silly stuff. Again, I wouldn’t characterise Burnham’s new-found principles as ‘silly stuff’, but otherwise it’s a sound analysis. If Jeremy Corbyn wins, the combination of a strong SNP and a left-wing Labour party might finally change the terms of the debate so that the Tories won’t get the easy ride they’ve got used to recently. And once the debate changes, ordinary people might also start to question the neoliberal consensus. This will be great in many respects, but I do fear that it could make Scottish independence less likely again, simply because it was the total disconnect between the political discourses in Scotland and Westminster that really fired up many Yes activists, so if UK Labour politicians start saying things we agree with, perhaps it will be harder to convince people that we need independence, even though Scotland will of course still only supply 10% of the MPs at Westminster. ← An EVEL matryoshka parliament?